The vision of Chapelwood was seen by 13 people who met October 2, 1948, to discuss forming a neighborhood Methodist church. Conrad and Lorene Bering, Chester and Arla Bintliff, Sally Carroll, Bill and Nitis English, George and Clara Hardeman, Berta Jones, Albert and Frances Lewis, and Carrie Rush vowed to "see this project through to its ultimate goal." They canvassed neighborhoods north and south of Katy Road to invite other Methodists to join the effort. The first worship service occurred in December 1948, with 19 present at the Boy Scouts’ Camp Hudson, Memorial Drive at South Piney Point. Early in 1949 the meeting place changed to Spring Branch School, Campbell Road at Long Point. The Sunday School, Board of Stewards, Women´s Society of Christian Service and Adult Choir were organized. A building site of five acres on Magnolia Drive (now Greenbay) was purchased. The name "Chapelwood" was officially adopted, a contraction of "The Chapel in the Woods." 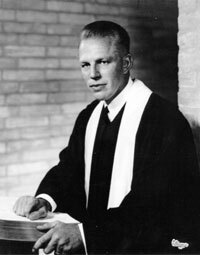 Various conference preachers filled the pulpit on Sundays; and in May, Bishop A. Frank Smith appointed our first pastor, Dr. H. Grady Hardin. Charter membership closed June 5 with 103 members on the roll. The charter was issued by the Texas Conference on June 6, 1949. Worship services and Sunday School moved to the newly opened Memorial Drive Elementary School on Smithdale in October 1949. A successful fund drive in 1950 raised $4,500 to match funds from the District Board of Missions and First Methodist Church. Church members cleared and staked the property, the county added a road, and a donated house was moved in for office and fellowship space. Boy Scout Troop 666, chartered in March 1949, was sponsored by Chapelwood beginning in 1950. As the congregation grew, annual events began: Vacation Bible School (with St. Francis Episcopal) and the all-church picnic. The temporary building burned in 1951, adding urgency to the building campaign in 1952 which raised $150,000 for a 500-seat Sanctuary and first educational wing. Houston architect Hamilton Brown was commissioned for the design and ground was broken on January 10, 1954. The Sanctuary was ready for two services on September 12. The sounding of seven chimes to end each Sunday worship was inaugurated. A Service of Consecration in November included Bishop Smith preaching and the choir singing an anthem written for the occasion. The new Sanctuary was one of three U.S. churches recognized in 1955 by the National Church Architecture Association and the American Institute of Architects, Houston Chapter. By 1957, additional classrooms and another five acres had been added. Frontage on Greenbay included a brick house which became the parsonage. The Methodist Men organized, the WSCS had four circles, and the youth had a choir and MYF. Rev. Hardin accepted a professorship at Perkins School of Theology and was replaced by Rev. Derwood Blackwell in June 1957. The following June Blackwell was succeeded by Rev. Kelly Williams and our first Associate Pastor, Rev. Carey Sayers. The Chapelwood Preschool was established in September 1958, for three-, four-, and five-year-olds. In the sixties, we sponsored our first missionaries, brought on an associate pastor for education, and added the Fellowship Hall and more classrooms. The Long Range Planning Commission next called for a capital funds drive to build an administration building, another classroom wing, enlarge the Sanctuary and buy five more acres of land giving access to Claymore. The Chapelwood Folk Singers began entertaining our members and community groups. In 1968, Ray Evans came from Dallas to be Director of the Ministry of Music, giving rise to an enduring graded choir program, bell choirs, and a dramatic enhancement of the Wesley and Chancel Choirs. Choral Workshop I was held in August 1968 at Rim Rock Ranch. Some annual services became enduring traditions: August Revival, the Wesley Choir musical, The Christ Child’s Tree, What Gift Have I?, and Come and Go Communion for Christmas Eve and New Year’s Eve. Our graduating seniors presented the first Senior Service, "We Believe in God" in 1969. Major renovations in 1970 added Sanctuary transepts and enlarged the choir loft, chancel area and narthex. A bride’s room and porte cochere were built next to the bell tower. The first phase of our Moller pipe organ was installed through the generosity of several families and Chapelwood Charities. A youth minister was hired. The WSCS became the United Methodist Women, began calling their April fundraiser "Spring Thing," and made beautiful Chrismons. The Kenneth Copeland Youth and Family Activities Center was dedicated in May 1974. Our community outreach included sponsoring Manna families, Wesley House, Casa de Amigos, House of Yahweh, and a quarterly blood drive. The first Faith Alive weekend was in January 1975. BOLD organized and were originally called the "The Senior Set." Bethel Bible Classes began in 1978. The Chancel Choir recorded five radio programs for The Protestant Hour. We bought an acre to the east for baseball and soccer fields. Youth members were added to the Administrative Board. With the 1980s came more building activity - a Sanctuary balcony, larger nursery, and a library. The pipe organ was completed with the addition of the antiphonal. A second story added a new choir complex, offices and meeting rooms. Purchase of a strip of land on the west boundary of the campus added more parking. The scout building was named the Fred L. Smith Scout Building. A business manager and minister for singles were added to the staff. We went online with computers in 1984. Singlefest was an immediate hit. The Chapelwood Foundation was established to receive and manage substantial gifts to the church. The Stephen Ministry started its valuable caregiving. In September 1990, the Board authorized major kitchen renovations and a two-story educational building: the Williams Building opened in October 1991. The Board also established the Kelly and Sara Williams Mission Fund and made its first dispersal to establish Grace Fellowship Church in West Houston. In June 1994, after 36 years of service, Dr. Kelly Williams retired. In July, Dr. James F. Jackson began his appointment at Chapelwood. A third worship service at 9:45 a.m. was added in 1994. The Mercy Street service on Saturday nights began in September 1997. The Long Range Planning Committee, beginning with a questionnaire to the membership, developed a master plan for enlarging and improving Chapelwood’s facilities and refocused our ministries on six purpose areas - caring, learning, praying, reaching, serving, and worshiping. The last remaining parcel of land available for expansion, 1.1 acres east on Greenbay, was purchased. The Event in the Tent, November 1998, launched a successful capital funds drive for $12 million. A tithe of the capital monies was committed to help build the Spring Branch Family Development Center. We also began sending global mission teams around the world to places like Kenya, Mexico, Haiti, Guatemala, and Estonia. In April 1992, the Administrative Board adopted a Mission Statement for Chapelwood: Guided and empowered by the Holy Spirit, we will lead people into a relationship with God through the love of Jesus Christ, enable individuals to become Christ-like, and call each member to respond to the needs of others. Our "Chapel in the Woods," still a friendly neighborhood church after 50 years, has a tremendous legacy. Bishop Smith called us a "miracle church and blessed of God" in 1950. As we´ve gone into a new millennium, we have every reason to believe that the Lord is with us. Chapelwood’s current mission statement is to "Make disciples of Jesus Christ for the transformation of the world by embodying God's grace as we receive it to those who need it." Today, Chapelwood consists of many diverse, close-knit communities within our church community at large, whose members are committed to extending God’s love, acceptance, and grace beyond the walls of the church. We consider it a privilege to share grace with all people, particularly those commonly overlooked by the typical church. Our Sanctuary worship services provide opportunities for more traditional styles of worship, Chapelwood ministers to the city’s homeless and recovering addicts through Mercy Street, we welcome and care for the physically and mentally disabled through Circle of Friends, we serve the Hispanic community in Spring Branch through The Branch, we nurture and encourage spiritual development through Contemplative worship and the Center for Christian Spirituality, and we reach out to young adults and a more diverse demographic through the Upper Room. Chapelwood uses online communication tools to broadcast messages of grace and biblical truth to those in the surrounding community, region, country, and world! In addition to offering live streaming video of our Sunday worship services, we launched our own Roku channel in March 2011, making it possible for nationwide subscribers to view live worship events as well as archived sermons and events on demand. This technology also makes it possible to provide on-location worship experiences for people such as those living in retirement communities and nursing homes. In 2012, Jim Jackson formed two teams to support the Senior Pastor identification and transition. The Leadership Transition Team and the Sage Team began meeting in August 2012. The LTT was composed of individuals who had experience on the Board of Stewards and on various key teams such as the Staff Parish Relations Committee (SPRC). From their diverse backgrounds they provided knowledge of best practices in the secular world, the ability of strategic evaluation, and the capacity of accurate discernment from multiple options before the congregation. The Sage Team was comprised of members who had long-standing relationships at Chapelwood. These are the persons who were around during the transition from Kelly Williams to Jim Jackson. They brought a sacred memory and wisdom to the process, which was shared in collaboration with the LTT and many others. Their role was to help identify the best practices of transition and support during a Senior Pastor transition. The LTT worked closely with Bishop Janice Riggle Huie of the Texas Annual Conference, who ultimately appointed our new pastor, Rev. Dr. John E. Stephens. to Dr. Stephens in a moving Investiture Service in the Sanctuary. Jim went on to preach his last sermon on Sunday, May 4, and was greeted enthusiastically by hundreds of Chapelwood friends and families after each Sanctuary worship service. After a period of travel, Jim´s ministry continued on, but in a new direction. 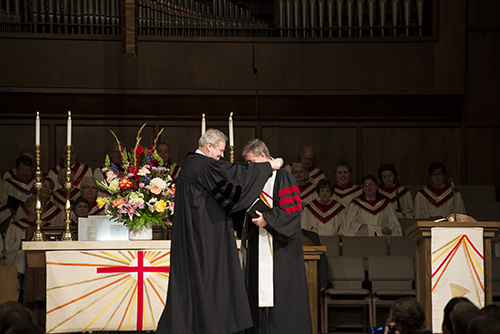 And now Chapelwood is moving forward under the direction of its fifth senior pastor. John Stephens preached his first sermon at Chapelwood on Sunday, August 3, 2014, launching a time of discernment and planning for Chapelwood’s future. John’s first few years have seen some significant changes. Esperanza, Chapelwood’s worship community located in Spring Branch, was renamed “The Branch.” The residential property on Greenbay to the east of the gymnasium became available for purchase, and Chapelwood acquired it, establishing “The Anchor House” as a site for small group meetings associated with the Center for Christian Spirituality. In early 2016, Chapelwood took its initial steps toward building a presence in the area just east of downtown Houston called EaDo, and the Holy Family community was born. 2017 saw the Fair Haven merger/adoption finalized, adding another worship community to the Chapelwood fold. Not long after that, the Branch moved from its home on Campbell Road to the Fair Haven Gessner campus. Hurricane Harvey showed Houston and all of Texas that God works wonders in times of crisis. Teams of volunteers, many from within our church and many from out of state, were welcomed, coordinated and directed by Chapelwood’s serving ministry. This effort would continue for more than a year after the floods receded, bringing hope to Houstonians, some of whom lost everything they had. 2018 saw the birth of Chapelwood Oikon, and in October 2018, the Upper Room community moved to the Heights Theater. Chapelwood’s history continues to be written each day. With 7,000 members, a heart for serving, worship, and discipleship, and a clear view for the future, Chapelwood members pledge to grow together and continue to share God’s grace within the church, the community, and the world. You are invited to become a part of the Chapelwood family. We are truly blessed to be a blessing to others, and welcome all who search for a church community.